Rose bushes that are not pruned are more than likely to grow into large tangled messes with small and inferior blooms. Attention to the how and when of correct pruning will have you growing attractive well shaped and sized bushes with large lovely blooms. As we gear toward fall, it seemed appropriate to remind folks when to prune rose bushes. Some of you may not have the first clue of proper rose bush growing etiquette and could use some pointers. So let's get started. The chilling temperatures of winter causes yard caretakers to do 3 things: 1. Winterize your Orbit lawn sprinklers. 2. Salt the driveway. And 3. Worry about the plants. However, the number one rule to rose pruning is not to trim your bushes right before winter. 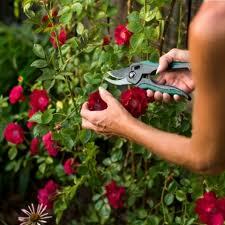 A very common misconception is 'since the growing season is over, now is the time to trim back the rose bushes.' With pruning, timing is everything. Pruning at the correct time is just as important as how you prune. It is also important to remember that bushes should not be pruned until they begin coming out of dormancy. This can be as early as January in warm weather areas, to as late as April in very cold areas. If you grow roses in colder areas then you should not prune until all danger of frosts is past. If you've gone all season without even trimming and it's gearing toward winter, it is okay to trim the stems back a little to keep them controlled. But don't prune if you sense a cold winter on your doorstep. There are 3 different ways you can prune your rose bushes. cut canes back to 3 or 4 buds from the base. This gives strong canes of about 4 to 5 inches in length. Do not hard prune with established bushes because they may not regrow. The only exception is as a last-ditch effort to revive sick or neglected bushes. This technique is best with grandiflora, new hybrid tea, and floribunda roses. Cut strong stems back to about half of their length. Weaker stems may be cut back even more. This technique works fine with established gardens of hybrid teas, floribundas, grandifloras, and tree roses. Cut the canes back to around 2/3 of their length. Any remaining stems can be lightly trimmed back. Light pruning is not generally recommended for most bushes as it tends to produce early blooms and poorly developed flowers. Use this technique only if other types of rose bush pruning are failing and the bush is an eyesore to begin with. Always keep the middle of your bushes free of growth. This leaves insects nowhere to live, and allows good air circulation helping to keep down fungal infection. Always remove any dead or decayed growth. This keeps your bushes looking better and again, keeps insects away. Shape your rose bushes as they grow. This transforms your bushes from wild and messy to precise and proper like all good roses. Remove crossing branches to promote stronger growth. Always use sharp pruning shears. And clean your shears after to remove any disease or fungus. Seal the cuts you've made to keep out disease. Just use regular white PVA glue, which works fine and is a lot cheaper than commercial preparations.